I think I've told you all, probably repeatedly, about my kitchen table. I love it so. I bought it in 2004 or 2005 for $100 from this chi-chi home accessories/boutique/everything store called Odette when they were closing up shop. This table had been used for staging something- I never saw it in use. When I did see it, it was in pieces. I had to badger them to give me a price on it, which I paid happily, even though we had to rebuild it. 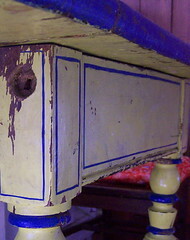 I LOVED the blue detailing- it reminded me of Carl Larsson's interior paintings. I've been using it happily for four or five years, giving it's scarred top a good coat of wax a few times a year to preserve its dings, bare wood, history. I've glazed pottery on this, used it as a photo drop (when I'm too lazy to go to the basement and turn on the photobooth lights), kneaded, wrapped gifts and packages to send off, eaten countless meals on this table. It is my desk on most days, as well, unless I need more room for the morass of papers come tax-time. Now this post becomes an elegy: soon this table will be moving up to my studio. I'll still love it and use it up there, but not in the same way. We're inheriting a table Gary has loved since he was five, which his parents had made out of native marble when they were stationed in Turkey in the mid 1960s (Gary's first memories were of Turkey). It is a beautiful round white wrought iron and marble table- much larger than this one, easily seating 6. I'm happy to take in his piece of family history, but I'll miss using this piece that was the cornerstone of so much of our young family's life.